Gold crowns can be used for many types of restorations – such as crowns, bridges, inlays, onlays – and may consist of either non-precious gold (NPG) or precious gold alloys. 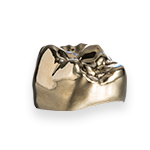 The key attribute of a gold crown is its longevity; gold crowns can last for a very long time, because their tensile strength makes them less susceptible to fracture than ceramic/porcelain crowns. Another advantage of gold crowns is that they are very gentle to the opposing teeth (similar to natural teeth), compared with porcelain restorations.